We partner with our customers in every endeavor of self-service laundry development—assisting them with site selection, demographic studies, equipment selection and installation, ancillary item selection, projections of income and expenses, financing options, laundry design and layout and ongoing technical services. At Wholesale Commercial Laundry, we work hard to help our clients develop highly profitable, successful businesses. Through careful differentiation of your new card- or coin-operated laundry, you can attract non-traditional customers as well as traditional self-service customers—adding to profitability. Simultaneously, through careful selection of equipment, laundries can cut utility usage, improve customer turnover and boost revenue. At Wholesale, our laundry development experts understand how to help you optimize your store for maximum revenue and profits. 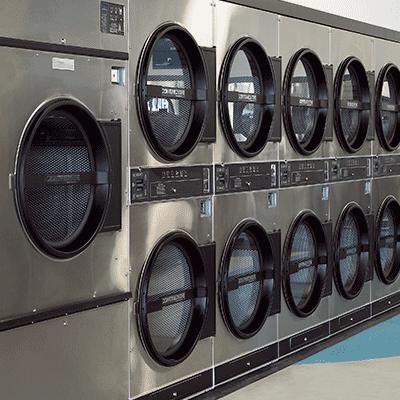 Express Laundry Centers feature Continental high-speed, freestanding laundry equipment designed to draw individuals craving a 60-minute wash and dry. The Express Laundry Center package brings together high-speed, energy-efficient laundry equipment, unique store services and marketing support. By choosing an Express Laundry Center over a traditional hard-mount washer store, you will not only save markedly on gas, water and electricity costs, you will improve customer turnover and profits. Expand your store's appeal and marketability by adding an ExpressLane of high-speed Continental laundry equipment. Whether you are remodeling, replacing old equipment, or building a new coin laundry, by adding an ExpressLane, you will save gas, water and electrical costs, and provide a 60-minute wash and dry for customers. The ExpressLane package also includes marketing support to help you get the word out about your store's new ExpressLane! Whether it’s drop-off drycleaning, wash-dry-fold or delivery services, coin laundries maximize their client base and profits by carefully incorporating added services. While self-service customers remain the cornerstone of business, stores with added services also cater to working professionals, large families and singles. Wholeale customers can feel good knowing that the laundry products they purchase are manufactured in an environmentally-friendly manner to conserve the Earth's natural resources and to create less waste. When customers purchase Continental products for their energy-effeciency, durability, and quality they are taking environmentalism a step further by supporting a company that works to manufacture them in a way that is less harmful, produces less waste, and uses fewer resources. Continental Girbau products are ISO14001-certified.